World Constructions Set is a Geographical Information System (GIS) based landscape creation program. It can be used to create still work as well as animations. It is based on a spherical planet using longitude and latitude. As many of you know who have read my reviews in the past, I often choose a certain perspective when I review a program. This doesn't mean that I am biased, but I am looking at the program from a certain position. In the case of World Construction Set 6 (WCS 6), I am reviewing it from the perspective of an artist, which is what I am. However, before I do, let me include some of the fields that use WCS 6, according to 3D Nature. They are people in: Fine arts, animation, film and TV, cartography, forestry, GIS, civil engineering, games, scientific visualization, education, etc. What are some of the features of WCS 6? This program resides on the computer without having to go into the registry. It utilizes OpenGL very well. It ran very smoothly under Windows XP without any glitches. When one looks at a scene, at any point, one can see the scene's data such as elevation, longitude, latitude, illumination, slope, etc. Ecosystems, which I will discuss more later in this review, can be comprised of many materials and can be separated into overstory, understory, and ground overlay. 3D objects can be brought into these ecosystems. One can create real fly-over animations of real places using WCS 6 alone or with other GIS software. To me the major strength of WCS 6 is its ability to depict in 3D graphical form places that are accurate geographically. There are interactive rulers available in WCS 6 that use both linear and Great Circle methods. 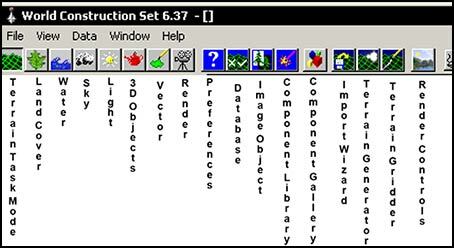 In WCS 6, objects are created or imported and placed by means of a vector. Or vectors are drawn and then attached to the object. Or Terraffectors™ are applied along a vector. There are terms unique to WCS such as Terraffector™. Terraffectors™ are displacement effects which can change the shape of the terrain and at the same time apply new Ecosystem texturing on either side of the vector.The term Ecosystem is also used differently in WCS and means one type of land cover. When one chooses to create a vector, the below menu is activated. The interface allows for drop and drag. Vectors can be dropped and dragged onto their respective components without having to open a new menu, for example. WSC 6 comes with a hardware key called a dongle. When WCS 6 is used without its hardware key, it becomes a render engine. This program can render on separate machines or over a network. I did not try it as such, but I rendered a simple still scene from one machine in a short time. One can export a scene and a DEM (Digital Elevation Model) or combinations in the Lightwave or 3D Studio 3DS/PRJ format. However, the program refused to export in the latter format. The render engine has the ability to do "pixel fragment rendering." The rendering uses High Dynamic Range data which allows HDRI saving, lighting, and effects. There are a number of menus allowing choices of rendering methods as well as what to include or not to include. WCS 6 has improved shadows, new volumetric atmospherics allowing for the creation of sunbeams and crepuscular ray effects, 3 types of cloud models with combinations, and a number of light types including the ability to use the texture editor to apply "gobos" or "cookie cutters" to the lights. When the lights are applied, they can also be set to exclude or include elements in the scene. WCS 6 also allows for post processing so that work does not have to be done in another program. 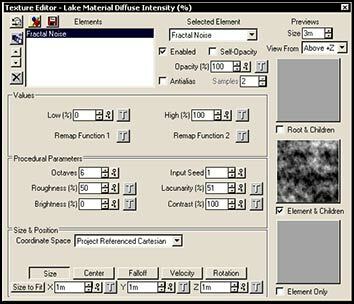 The post processing also has an include and exclude feature for specific effects. One could say that DEMs are the cornerstone of WCS 6. These can be imported or created. Below is a partial list of mostly free sites gathered from 3D Nature's web site as well as from my exploration of the web. As stated previously, one can generate terrains that are purely make-believe or one can use terrains that reference known places. 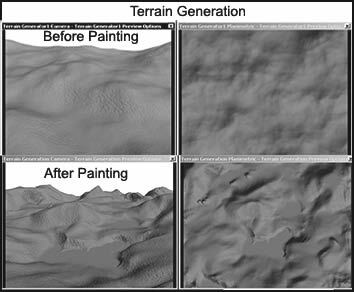 By accessing the Painting command, one can manipulate the shape and elevation of the various elements of the terrain. Once the form of a terrain is constructed, one can set up a full environment from scratch or import one from WCS 6's Gallery. Placed on a created DEM, the Grand Canyon looked like the following. There are other ways to start a project. One can apply ground cover. Again, this can be created by importing or creating different types of foliage, or one can bring in an Ecosystem from the Gallery and either use all of it or a part of it. These components can then be reworked and saved as new components in their altered state.The Ecosystems can be set it up according to the rules for that particular type of terrain as they occur in nature or these rules can be overridden. he flexibility and choices are huge in this program. Most variables are driven by Textures. The "T" in the box means Texture. 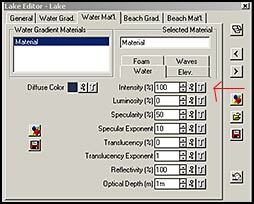 The following is an example of all the elements that control the color of the lake material. The next screen capture shows the controls available for adjusting just the intensity of the lake material. Individual tasks in a scene have their icons on the main top toolbar. The below screen capture shows a partial view of the toolbar. There are other tasks, such as moving, rotating, etc. that are not pictured. Each Task Mode expands and is used to create the elements that make up a scene. The interface also contains some unusual aspects. For example, the Undo command is generally attached to the menus and is not part of the Edit command in the upper toolbar as it is in most programs. However, there are a few exceptions. The undo command for creating vectors is part of the toolbar. WCS 6 is a very time intensive program to learn. It comes with three CDs of tutorials in two forms, html and movs. While the tutorials are systematically written, most were written in 2002 and parts of them do not work properly. This becomes a problem, when you cannot complete a tutorial as shown in the html or mov. I used this program under Windows XP. There were no drivers specific for XP, but the program will accept other drivers. You need to let it find the correct ones on the CD. However, when you upgrade to version 6.37, you need to follow the link on the update page of the 3D Nature web site as well as read the instructions on the specified page. After going through all the tutorials, some a number of times in order to understand the program as well as creating a number of scenes from "scratch," my evaluation for it as a program for an artist to purchase is negative if a person wants to learn a program quickly. However, as I found out, if someone is willing to spend time experimenting and working with the program, the results can be perhaps satisfying because almost every aspect of a landscape can be controlled. However, learning how to control it is the key and this door is hard to unlock for a few reasons. One reason is because there are limited avenues to acquire the necessary knowledge. Where other programs have books or a number of forums, WCS 6 has one Yahoo forum, some tutorials, and an online manual. Most of the Yahoo community of users seem to be using the program for technical purposes and not artistic ones making the emphasis different. Also, I found too many questions that I wanted to have answered and didn't feel I should have to go to a forum. For example, the term "Resolution" is used in a number of ways. When you generate your own DEM, how you generate it, generates its "Resolution" in meters. I could not find out how to control this when creating a DEM even though I could see a relationship. I like to be able to understand a program so I can use it to its best advantage. 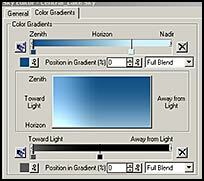 Another example of a hard to control area involved creating a sky that had a good gradient color. While I had read and experimented with gradients and their different blending modes, I could not create a pleasing sky no matter how I manipulated the two gradients . While certain things were easy to create, others were very hard. Realistic water, especially waves, fell into the latter category while sand dunes were a snap. I am basing some of this from experience using other landscape generating programs. I only worked with still scenes except in the tutorials. According to the 3D Nature rendering tutorial #9b, the time to render an animation can be as long as 30 minutes per frame if you are using one computer (the speed of the computer is not specified) but the windows recommended system specs are: "1 GHz clock speed or better, Pentium II or later, 256 MB Ram or more, 1GB of disk space or more, OpenGL compliant Video Card, Windows 95, 98, Me, NT, 2000 or XP." However, you can set up render farms and use a multitude of computers if they are available to considerably shorten the times. It is also suggested that you download a program called Super-Conductor. This program is free. I whole heartedly see this program as being an excellent program for industry that can have its personnel trained to use it for a specific purpose. It's ability to create projects that can contain longitude, latitude, and elevation and be able to reference a structure, for example, by specific coordinates is its undeniable strength. 3D Nature runs training sessions. For information and cost, see the 3D Nature web site. The cost of the program is $500 and the cost of the training sessions vary. The best way to decide on a program is to experiment for oneself. The following "link" page discusses the demo version availability. And the following pages give a taste of works from the 3D Nature Gallery as well as other information about 3D Nature products.